One of my favourite stores in the UK, Marks & Spencer has launched M&S Opticians this year and are currently operating at 5 locations all over the UK - Westfield White City in London, Manchester, Bolton, Derby Intu and York Vanguard. The extremely user friendly website makes the entire eye test appointment booking experience as smooth as spreading peanut butter on a toast! Appointments are available in the mornings, afternoon or in the evenings and it generally takes around 30 mins for the entire eye test. The website gives the users option to select their desired date and time and it just asks for an email address to send a confirmation of the booking - it’s as simple as that! I feel booking for an appointment online is much more convenient than choosing to book via phone as one gets all the information and options to choose from. Since it’s advisable to get an eye test done once in every 2 years and mine was due, I decided to try the M&S Opticians at the Westfield White City in London. Few days before the test, I also received a call to remind and to check if I’d be attending the appointment. 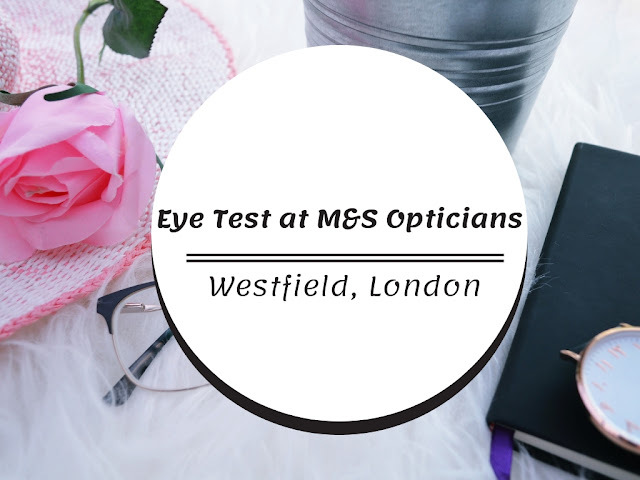 At the M&S Opticians, the eye test started after a quick chat with one of the staff, who inquired for a few personal details & consent to be included in the email list. She then took me to a room to check the health of the eye and started with the Otrofactor, a machine used by the ophthalmologist to test the vision ..prescription and measure front surface of the eye. The machine takes a photo of the back of the eye retina in order to measure general heath of the eye. Step two was to be checked by a Tornometer - the machine used by the eye care professionals blows puff of air inside the eye and the idea is to check if the eye is able to take high pressure or not. It determines the intraocular pressure & the fluid pressure inside the eye and evaluates any risk of glaucoma the patient might be having. This process is repeated thrice on each eye to ensure an accurate result. The third machine called the slit lamp is basically an instrument that consists of a high-intensity light source that can be focused to shine a thin sheet of light into the eye. This machine checks the vision of the lens of the eye and provides a magnified view of the structure of eye in detail that enables the eye specialist to diagnose a variety of eye conditions. Once the health of the eye was thoroughly checked, further test was done using the different lenses to ensure the correct status of the vision and a machine called the Pupilometer was also used to measure the pupils distances. The team at the M&S opticians conducted a very comprehensive and thorough eye test, and the service was brilliant! Due to the variety and choice of various frames available at the store, it did take some time for me to finalise my glasses as I wanted to go for something that suits my face well. Once my glasses were ready, I was notified via sms to arrange collection from M&S Opticians in London. My glasses were absolutely perfect in vision and the staff tested it on my face to ensure it fits well. All the watermarked images are the property of Blogs by FA. Disclaimer: This post is in collaboration with M&S Opticians! Oh M&S optician? I had no idea. I love M&S and they're a brand I trust so this sounds like the perfect combination. I had no idea about M&S opticians. this looks great though as I'm a glasses and contact lens we are full-time! Finding somewhere you trust to have your eyes tested is so important! I didn't even know M&S had opticians! This looks very professional! We live in London and often around - got to check it out one day soon! Need new glasses!